If you want your kids to bask in the afternoon sun in your very own yard, setting up a wooden swing set can be an excellent idea you can consider. They can revel in their own playground with mirth and excitement without getting away too far from home. The swings, the clubhouse, the slides or the monkey bars can burr teamwork, creativity, and unlimited fun! Giving your kids their own space to play and have fun outdoors can steer their attention away from the distraction of gadgets, video games, and other devices. It will give them the chance to take delight in physical activities that will open the doors for learning, physical development, and social interaction. 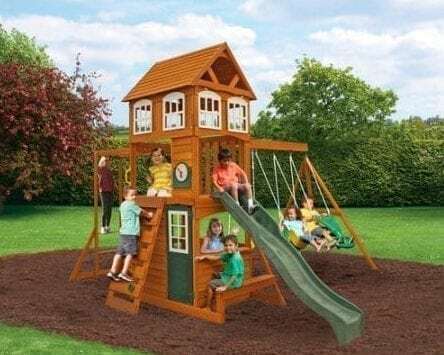 And if you’ve decided to put up one at home, our in-depth guide and roundup of the Top 10 Best Wooden Swing Sets in 2019 will lead you to the best-selling choices. 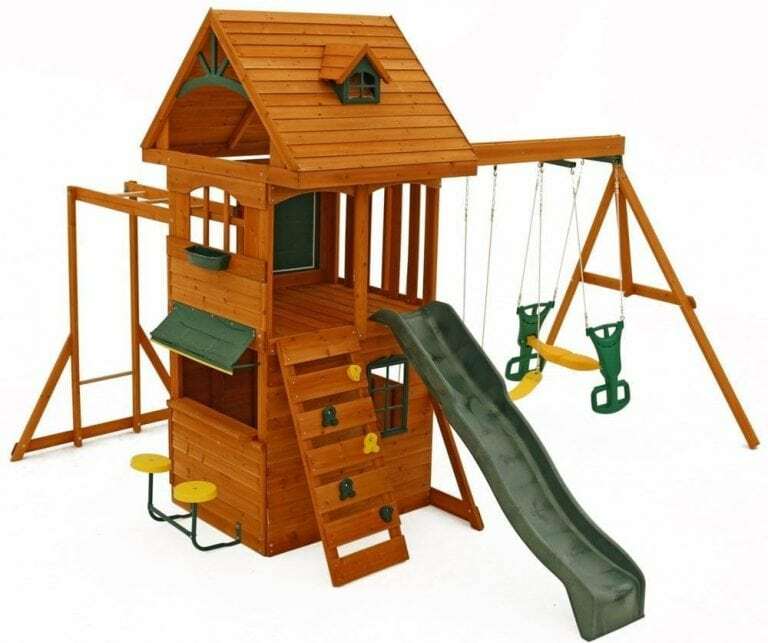 The market offers great deals and best-selling wooden swings sets you can ever find. 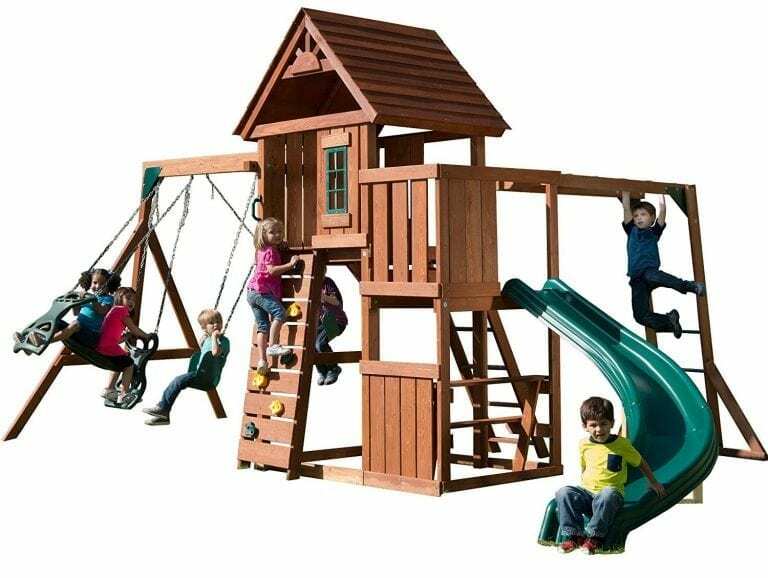 If you haven’t picked out our choice yet, we’ve provided a lineup for the top 10 best-selling wooden swing sets. Check them out. 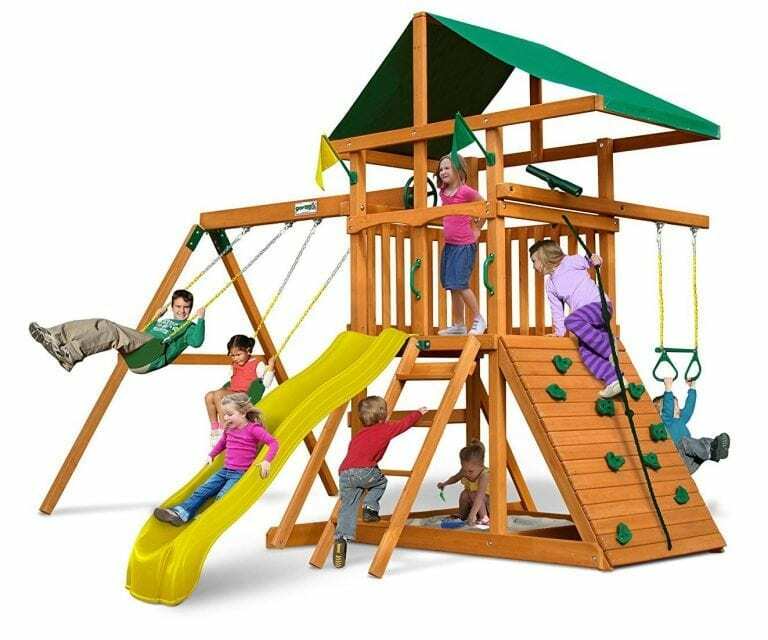 The Backyard Discovery Tanglewood swing set has got a clubhouse, a slide and swings your kids can definitely enjoy. The structure and design exhibit a very imaginative style that can offer all sorts of fun. As it is built from 100% cedar wood, it ensures durable quality that can last for a long time. To enhance the appearance, the wood has also been treated and pre-stained. Although the installation is generally difficult, Backyard Discovery has found a way to make it much easier. There are cuts stamped with their designated numbers to speed the assembly. It also helps you place the parts correctly and where they should really be. And to fortify the foundation, the brackets are heavy-duty. 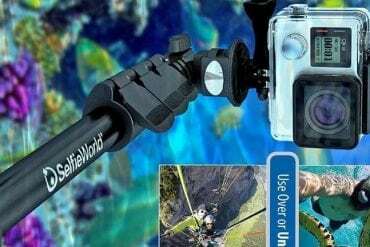 It also comes with the patented Safe T-fuse hardware for easy and safe construction. 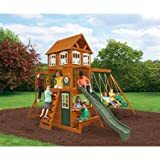 Kidkraft offers a vast array of wooden swing sets, and one of the first sets we’ll uncover in this list is the Big Backyard Brightside set. 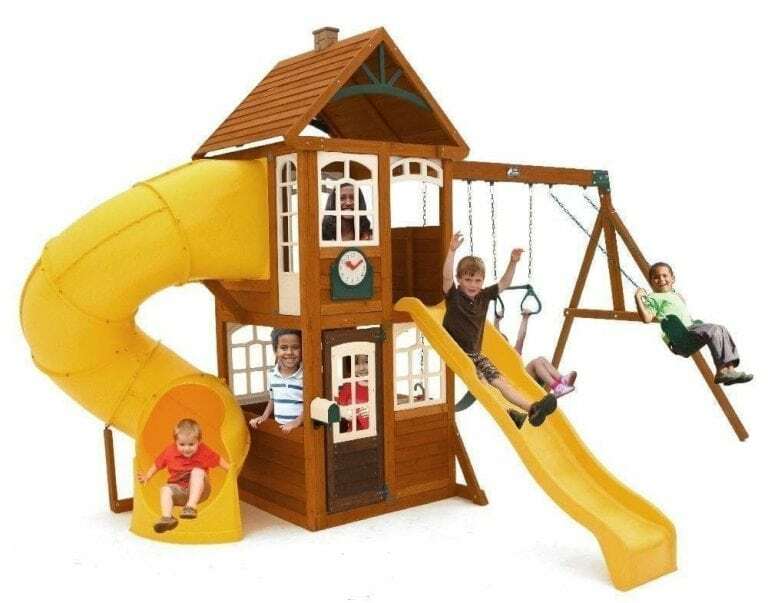 It is much simpler than the one previously mentioned, but it also includes a mini clubhouse, slide, and swings. But this one comes with monkey bars for additional fun! And to make sure there is enough room for everyone, Kidkraft designed it with a capacity of up to 9 children with a maximum of 110 lbs. each. The clubhouse is shaded with a roof and when you get inside, you’ll see a chalkboard where kids can express their creativity in drawing. The lower part of the clubhouse has a mini snack bar which is also shaded with a roof. Each and every corner is well-built and if you have it done according to the instructions, you’ll surely have a safe place for the kids to play. The solid and high-quality cedar wood is constructed with a warm, amber pre-stain for an excellent quality. 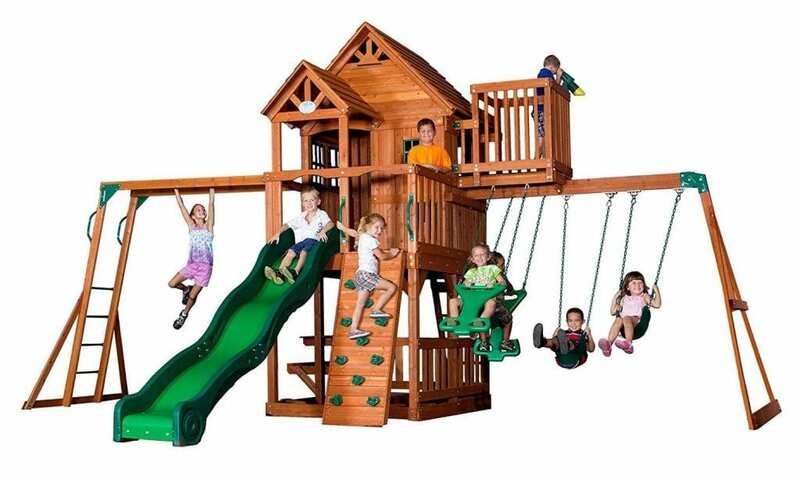 Another entry from Kidkraft is the Cranbrook Cedar Wood swing set. Everything were well-made and built with cedar wood for superior durability. The design and structure are simple but quite preppy for the kids to enjoy. There is a clubhouse with a roof and a mini snack bar in the ground story. If the kids want to access the slide or the 2nd story of the clubhouse, a ladder will do. Apart from the slide, they can also choose to play and stretch their muscles out on the monkey bars or take delight in the wind through the swings! Just like most swings sets, the assembly can take a few hours. But Kidkraft ensures a durable and long-lasting quality with their heavy-duty parts and premium quality of wood. The sturdy construction will definitely keep your kids safe while having fun! 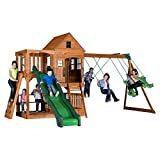 The Ridgehouse Clubhouse Deluxe swing set from Big Backyard displays playful hues and design that the kids can indulge in under the summer heat! They can choose between the slide, swings, and monkey bars to play and express their active personality. Or they can just hang out and relax in the clubhouse. It comes with a mini snack bar with stool seats and a cafe where kids can eat and play. As it is placed outdoors, Big Backyard makes sure that the frames and parts are completely sturdy and can withstand the heat and other types of weather. 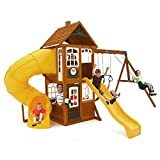 When the kids go for the slides or the clubhouse, they can get through the ladder which is also designed with multi-colored rocks for basic and easy wall climbing. Once you have this all set up, your kids will definitely have an enjoyable time. You can spruce up your own backyard with this big beauty. The Backyard Discovery Pacific View exhibits an innovative design with a bigger clubhouse for the kids to have fun. The kids can get their spots in the in either of the swings: one-seater and two-seater swing. They can also glide down to the ground with the slide attached to the clubhouse. And if they just want to take a break from playing, the clubhouse can be an excellent space to hang out. It is wider compared to other designs and is roofed to protect the kids from the sun. Just what Backyard Discovery promises, this innovative piece offers a safe and secure place for the kids. The frames are made of cedar wood and crafted with premium quality parts such as brackets and the patented safety t-fuse locks for enhanced durability. And to make sure they can swing safely, the swing beam is laminated and built strong along with the steel clamshell brackets. If you’re looking for a perfect place for your kids to show off their creative and artistic side, the Swing-N-Slide outing play and swing set definitely deserve a spot in your backyard. The kids can indulge in different sorts of recreation in this set. It has a sandbox where they can play and frolic in the sand. There are two swings that will give them a fun lift in the air. And if they want to practice their muscle strength, they can revel in the rock wall and trapeze bar! It is loaded with a lot of fun! 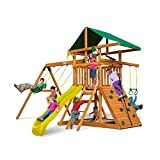 When it comes to structure, Swing-N-Slide innovatively created the whole set with a cedar wood that resists damage and decay; gives your kids a lot of years to play in this swing set. With its UV-protected swing chains and soft rubber grippy plastic coating, it can resist the harsh effects of the rays during hot days. It keeps the chains cooler and more durable. 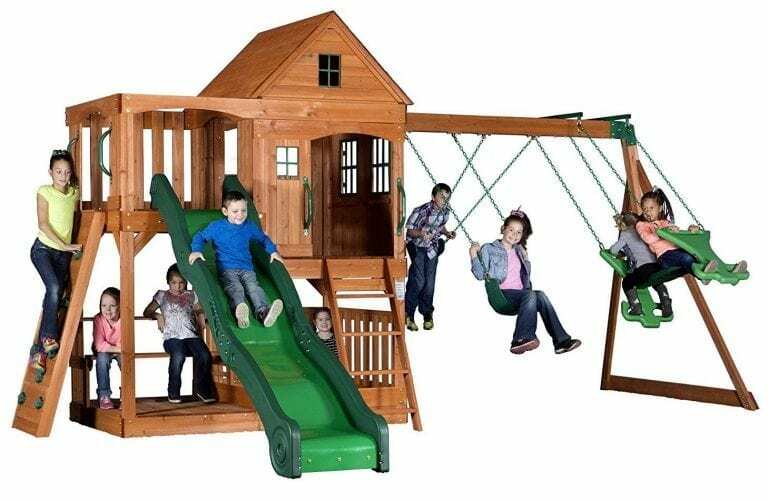 If you have a vast space or yard at home, you can make use of it with this big swing set from Backyard Discovery. Compared to the ones previously mentioned, this one cradles different forms of fun and creative spaces for the kids. The 2-story clubhouse provides a spacious spot with a snack bar in the first level and a mini balcony in the second. They can bask in the afternoon sun or breathe in the fresh air while playing! Monkey bars are also included. There are three swings, a slide, and a rock wall where they can unleash their strength, interaction with other kids, and creativity. As it is much larger than other sets, Backyard Discovery makes sure it is well-built. The cedar wood, metal brackets, and heavy-duty swing chains make the quality long-lasting. Another option you can consider is the Lewiston Retreat swing set. This one’s from Kidkraft as well. 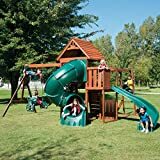 Known for their creative and durable swing sets, the Lewiston playset is built with heavy-duty parts to keep every piece of the set sturdy and perfectly safe to play in. It is a clubhouse with a mini kitchen in the first level. Your aspiring little chefs can enjoy the replica of a kitchen together with the complete accessories and parts. The slides are probably an eye-catching design that your kids would want to try. It actually comes with two slides: high rail wave slide and twist and ride wave slide. The clubhouse has a wooden faux stone chimney and a roof to provide enough shade under the sun. And if they just want to swing through the air, there are two swings they can ride and a small trapeze bar! Swing-N-Slide offers another creative swing set from their lineup. This Cedar Brook Playset is a big play haven for the kids where they can opt for their desired rides. They can glide down from the slide or give themselves a bit of challenge from the rock wall and monkey bars. The swings will also be a great ride if they want to get a quick and fun lift in the air. But the clubhouse also provides roomy spaces for the kids to hang out and play! Swing-N-Slide guarantees a sturdy foundation from the premium and pre-cut lumber and hardware. With the instructions included, you can build the swing set piece by piece with full assistance. 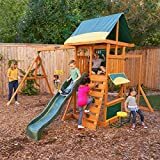 Because it meets the safety standards for backyard use, it promises a long-lasting quality that your kids will definitely enjoy using for many years to come. 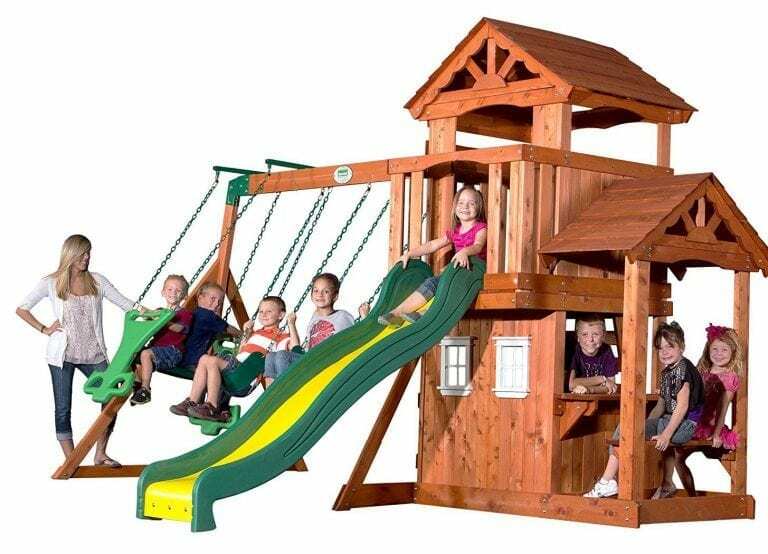 Taking the first spot on our list, it is the Grandview Twist Playset from Swing-N-Slide. As the name suggests, this offers a grand view with creative and innovative rides for the kids. There are two slides, the sidewinder slide, and the turbo tube slide. That’s double the fun! They can also revel in the endless fun with the monkey bars and test out their strength and creativity. If they want to take in some fresh air under the sun, the swings or the mini balcony in the clubhouse would be their perfect spot! There is also a ladder and a rock wall to enhance their skills and physical strength. The swing set features the patented bracket system for quick and easy installation. Although it does take a few hours before you get everything done, Swing-N-Slide makes sure you assemble the parts and pieces correctly with the instructions included. As it is loaded with a lot of fun, it will help your kids stay active and physically fit! 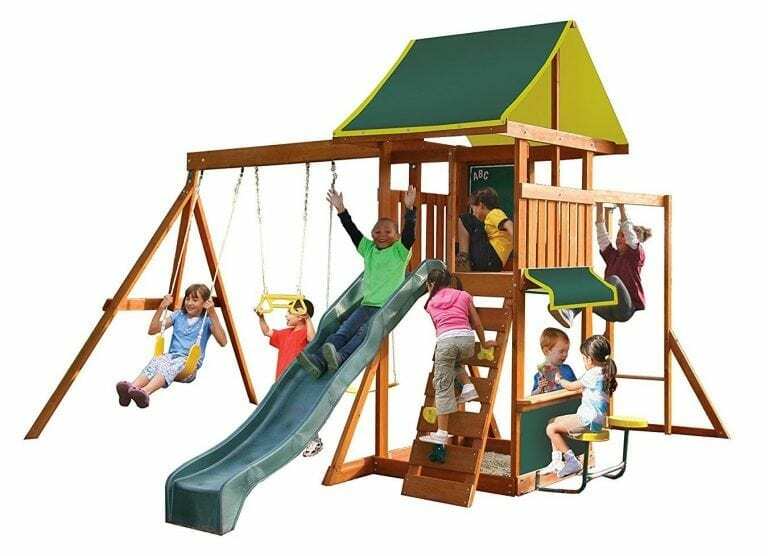 CHECK THE MATERIAL AND DURABILITY: Wood is the common and best material for swing sets because of its excellent resistance to mold and decay. Cedar and lumber wood are the best types. 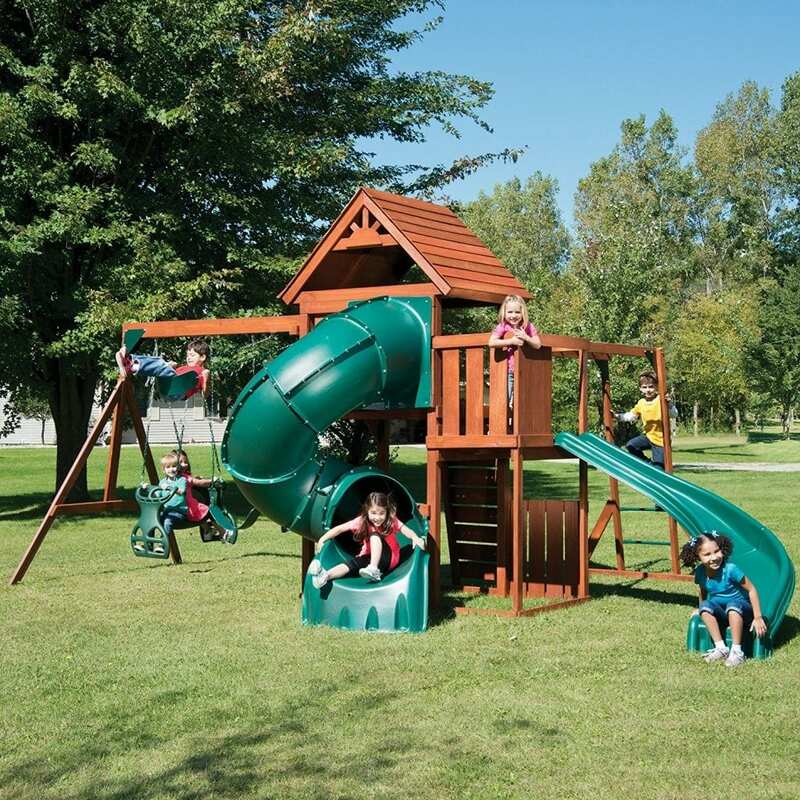 As it provides a sturdy foundation, it’ll give you peace of mind when you let your kids play. So, if you opt for a wooden swing set, make sure it is made of high-quality wood and parts for superior safety. Along with the wooden frames, the metal brackets and locking nuts should be heavy-duty and rust-resistant. As it will be installed outdoors, it is best if it is weatherproof to withstand different types of weather and harsh elements in the environment. Some swing sets are made of treated or pre-stained wood for a smoother appearance, added protection, and enhanced durability. You can also consider this option according to your preference. CONSIDER THE LOCATION OR SPACE: Another important factor to consider is the space or location. This is a huge set-up that requires a spacious location. If you are going to put it up in your yard, make sure it is large enough for the swing set. Manufacturers always provide the detailed dimensions so make sure to check this information carefully. INSTALLATION: Expect that there are a lot of parts when the package arrives. It can be a little tough to assemble everything and place all the parts accordingly. Just make sure that the parts and pieces are complete and don’t have any damages. Afterward, referring to the owner’s manual for the complete instructions for installation. Others are downloadable online. Unpacking the parts already takes a lot of time, and the installation can consume more. Some consumers installed it in 12 to 14 hours or more. It depends on your skill and speed, though. But to make sure you put all the pieces correctly, check the manual carefully. If you’re having a hard time with the assembly, you can always ask for a professional to do it. CAPACITY: It is essential to determine the overall capacity of the swing to help you identify the average number of kids who can play in it. Too much crowd and weight may compromise the safety. 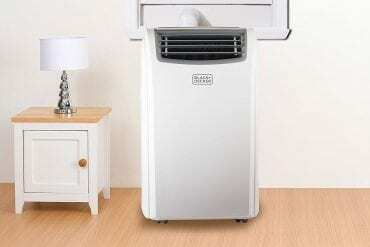 Although it is built with a sturdy construction, it is still very important to abide by the limited capacity. Not only does it keep the structure durable but also your kids safe and secure. KNOW YOUR BUDGET: The budget for this playset is no joke. 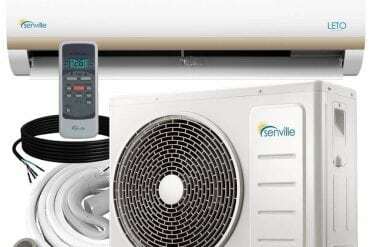 If you’re planning to invest in this product, it is significant to determine your budget and expenses. In that way, you’ll know how much you can use for this whole set. You can always go for the best deals and discounted prices if you have a limited budget. Setting up a wooden swing set in your own backyard gives your kids their own perfect spot to have fun and interact with their friends. As it allows your kids to move and use their strength, it also helps them develop their physical strength, creativity, and teamwork. This can also be a building to learning and maintaining a strong social interaction. 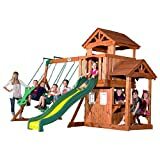 There are a lot of options in the market for wooden swing sets. If you cannot find the best one for your yard, you can refer to our list and comprehensive guide for the best-selling swings sets with excellent features and reasonable prices. Pick the best one for your kids and let them have fun!